Prior to 1828, Rigdon apparently believed in the “Arminian” conversion process. This process involved three steps: (1) faith, (2) repentance, and (3) spiritual rebirth. This sequence appears in those sections of The Book of Mormon that were likely written before 1828 (i.e., before the lost 116 pages incident). See for example Mos. 5:7, 27:24-27; Alma 5:12-13; 22:15- 16; and Alma 36:16-24. In these sections, baptism was a sign of having been born of God, not a requirement for spiritual rebirth. 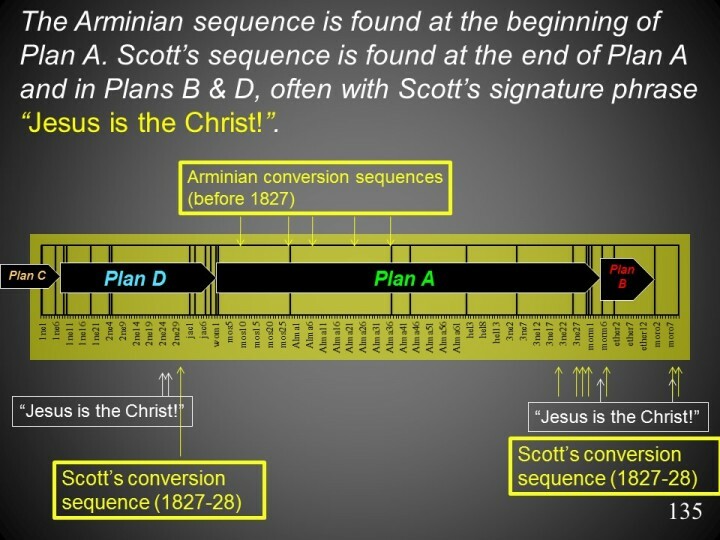 Scott’s doctrine of faith, repentance, baptism appears in the “small plates” prepared to replace the lost Book of Lehi (2 Nephi 31:11-14) and near the end of The Book of Mormon (3 Ne 11:25-26, 35-36; 18:11; 27:19-20; 28:18; 30:2; Mormon 7:8-10; and Moro 6:4; 8:11). These are the same general locations where we find Scott’s phrase “Jesus is the Christ” (Moroni 7:44; Mormon 5:14; and twice in 2 Nephi 26:12).